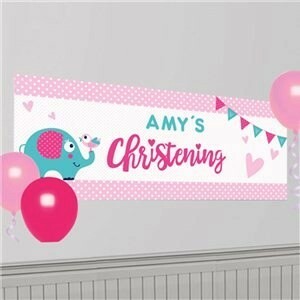 Christening Day Pink Personalised Banner is an adorable banner that comes with stickers so you can personalise the banner as you wish. It is decorated with the cute little elephant and bird, and has a lovely border of pastel pink and white dots, with a pink and blue bunting in the corner. Fabulous.